It’s my opinion that Skylanders now occupy a space somewhere between toys and games, outside of what we’d typically associate with software for a next-generation console like PlayStation 4; despite a necessary role in maintaining a healthy stream of brand new gamers to keep our favorite medium steady for the next two, possibly three decades. How could PlayStation maintain itself as a brand without something like Activision’s toys-to-life series? You certainly can’t say that Nintendo isn’t leaning on Skylanders to keep Wii and Wii U sales moderately healthy, so in looking at the game for PlayStation LifeStyle’s review, I’m taking a decidedly different tactic. Having already written a review of Skylanders Trap Team for GameRevolution, I’ll say right now that the scores between these two sites will not be perfectly reflective of each other. I took a path of least resistance on the website I typically write for in order to evaluate Trap Team on a base level of competency compared against the rest of the brand’s history and in all honesty, I think Skylanders Swap Force did a better job last year. Still, there’s something to be said about Trap Team’s gorgeous visuals, its intricate hardware, the toys that may have stacked up over the years and carry over into this new game, and the possibility that you could swing a new PlayStation 4 console this holiday season if you use it to bond with your children or a significant other curious enough about gaming to jump in, so-to-speak. When I visited Toys For Bob, jumping came up only briefly, as the mechanic was added to gameplay a few years prior despite the importance to fans or casual gamers. People like hitting buttons the second they put a disc into a console and that’s held true since before even the first PlayStation console. Let it be known that Trap Team actually doubles down on this kind of thing with tons of different distractions for longtime fans who’ve already grown accustomed to the Diablo-esque combat, upgrades, loot, and boss battles. 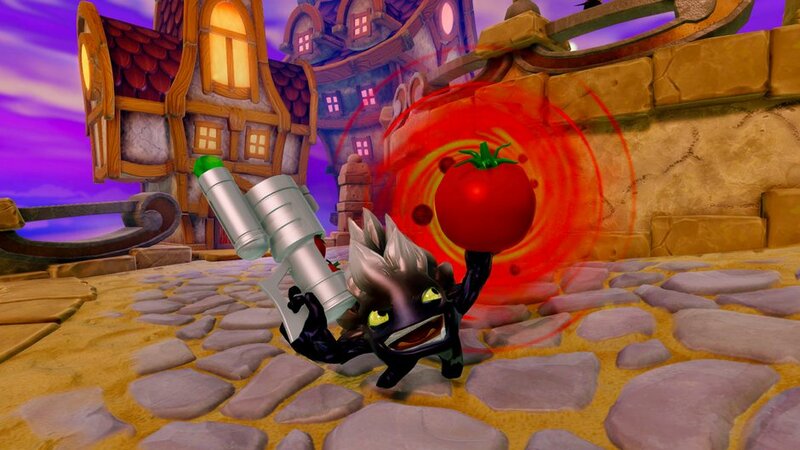 In addition to taking a beloved Skylander character through each level, purchasing new moves, unlocking new aesthetic and stat-boosting gear, and generally laying the smack down on the forces of short, bald, evil dude, Kaos, you’ll find card games, radio stations, and new mid-boss level encounters that add to the number of playable characters. That is Trap Team’s big conceit this time around. 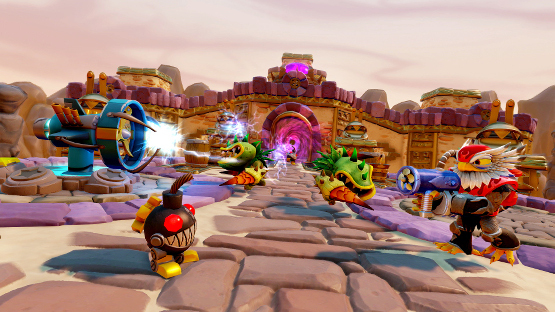 Rather than swapping top and bottom halves of Skylanders or using giant-sized characters to your advantage, players can collect the enemies they fight in-game with Trap Gems, plasticine, sculpted hunks of more-stuff-to-buy that hold essentially the same microchip to communicate with the software. Pulling the L2 trigger switches between your Skylander figure on the new portal of power and the enemy you’ve trapped in a gem and inserted into the portal, near a new speaker from which those enemies spout off funny dialog. There are 46 different enemies to trap and while you can only carry one enemy per gem, it’s easy to switch in-between levels and you can buy a second gem of the same element affinity to grow the number of enemies you have at your immediate disposal. Still, who would do that? That was my primary gripe in the other review. Be aware of how much money you spend on Skylanders stuff because I’ve found that certain toys inevitably fall by the wayside. Waste-not want-not when it comes to your holiday shopping this season, especially if your end goal is to nab a new PlayStation 4 console with the Trap Team starter pack. The starter pack comes with a single Trap Master figure (you’ll want more of these as only Trap Masters can break open crystals that reveal new branching paths in each level), a standard figure, and two trap gems of different elements. Unfortunately, for longtime fans of the franchise some of the elemental gates will refuse to open for older Skylanders figures. Trap Team is the camel’s hump in Activision admittedly brilliant business plan. 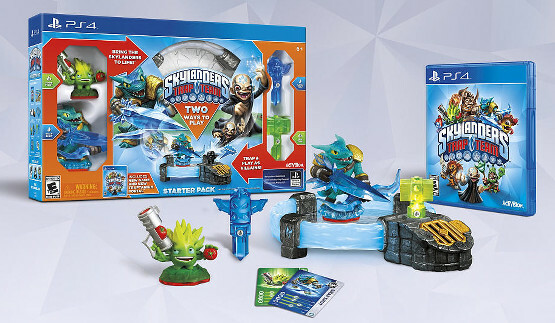 Following Skylanders Swap Force, fans could probably assume that a new portal would debut alongside this year’s game and such consistent generation leaping grows the investment year-over-year, whether your child is buying Skylanders figures on his or her own or not. That doesn’t come close to fading the fact that Trap Team represents an incredible value in supporting all of the old toys and encouraging the same cooperative gameplay that’s endeared so many thus far. Particularly on PlayStation 4, I’d like to stress that Skylanders retains a heavyweight title as the best brand in gaming for parents and children to bond over. I don’t need to play through the entire experience to start grinning when Flynn, voice by Patrick Warburton, issues an entertaining line in the hub world or when Food Fight, the standard figure included in the starter pack, upgrades his tomato guns for more damage and actually takes down a boss while we’re at it. Those radio stations and card games prove incredible distractions for anyone with a mind willing to wander too. I could start any number of Skylanders reviews with self-abasement, apologies, or any number of other I’m-too-old-for-this qualifiers, but the truth remains that Sony, Microsoft, Electronic Arts, and countless other publishers ignore a key demographic in gaming. Trap Team caters to the children and adults that wish Cartoon Network never aired a live-action anything. It reaches beyond first-person shooters and open-world action games to sit somewhere between too simple and not simple enough. There’s a reason a child could explain every character and action in great detail until a disinterested adult turns blue in the face, and it’s that situation that’ll get me to fall in love every single time. No, I’m not all that pleased with the ways Toys For Bob decided to “innovate” on the brand’s core competency in this year’s game. I would rather see these toys encourage experimentation, learning, and growth outside of the game world and when boiled down to gameplay, trapped enemies are no more fun to switch to than it is to remove one figure from the portal to throw another down. Still, if all you do is spend $150 on a starter pack, two more Trap Master figures, and possibly two more Trap Gems, it makes the value proposition for a brand new console under the Christmas tree that much easier. I would rather go on thinking of the next ten years in PlayStation 4 development that way as it is. It’d be far more entertaining to see families grow around the platform through this kind of software, these kinds of real-world-to-digital-world transformations. It’s the difference between a side scrolling Super Mario World and all of the paintings Nintendo’s plumber dives through in Super Mario 64. It’s Uncharted 3’s cargo plane versus that first long glide across a map in a Spyro game (who, by the way, falls into obscurity with the fourth release of this franchise). If you’re looking for a way to add value to your next-generation console both in number of in-home users and with lengthy gameplay campaigns centered around each of your favorite Skylanders characters, Trap Team does the trick. It’ll certainly carry fans through to 2015 where Activision has new surprises waiting, without a doubt. Even if you’re as disappointed as I am by the thin layer of gameplay added with Trap Gems, it’s hard to deny the wealth of charm, intelligence, and generation-spanning humor Trap Team manages to accomplish this year. Review copy provided by the publisher. Additional figures and trap gems provided by the publisher. For information on scoring, please read our Review Policy here.